Fred is the main character of the series. He's an accident-prone bronto-crane operator at the Slate Rock and Gravel Company and the head of the Flintstone household. He is quick to anger (usually over trivial matters), but is nonetheless a very loving husband and father. He's also good at bowling and is a member of the fictional "Loyal Order of Water Buffaloes" (Lodge No. 26), a men-only club paralleling real-life fraternities such as the Loyal Order of Moose. Acrofatic: He becomes surprisingly light on his feet when doing his famous winning bowling technique. Agony of the Feet: Especially when he goes bowling. Angrish: Fred would spit out nonsense whenever he's angry. Big Eater: He is known to polish off Bronto-Burgers with little effort. Big Fun: At his best. Despite his harshness, he can be friendly. Bumbling Dad: He was already a bumbling husband from the very start of the show. Naturally, good ol' Fred behaved no differently once Pebbles was born. And exclusive to the Fruity/Cocoa Pebbles commercials: "Barney! My Pebbles!" Cuteness Proximity: Whenever he's with Pebbles. Which is interesting because in the beginning, Fred has absolutely no interest in babies, until he spends some time with Barney's nephew Marblehead. Expy: His personality was based on that of Ralph Kramden of The Honeymooners and Riley from The Life of Riley. Fred: Bet...bet...bet! BEEETTTTT! BET-BET-BET-BET-BET-BET-BET!!!! !note "Wait a second. There's nothing funny about an addiction. Vote NO! on Indian gaming laws. Hair-Trigger Temper: Fred loses his temper easily and is very impatient. Happily Married: With Wilma, though they have their issues sometimes. Hard Head: Once saved Barney's life by shoving him out of the way of a large falling rock at Fred's workplace, only for it to hit him square on the head and drive him into the ground. He was perfectly fine. Henpecked Husband: A staple of The Flintstones, which tended to follow the source material very closely in this respect — minus the obvious underlying affection. Heroes Want Redheads: Hes married to the redheaded Wilma. Heterosexual Life-Partners: With Barney, one of the most iconic examples. No matter how many spats, misunderstandings, and embarrassing troubles they may find themselves in, these two blockheads always got each other's back at the end of the day. They even have a song lampshading it in the 1966 film, appropriately titled "Teammates". I Am Big Boned: Fred isn't fat. It's all muscle. He then dared Betty to sock his belly to show it. She answered the dare. Fred felt pain but wouldn't scream until he was sure he was out of her hearing range. Large Ham: Pick any emotion: angry, sad, happy, or just brimming with excitement. When ol' Fred wants something off his chest, he REALLY lets it all out. Manchild: He often annoys his wife with his buffoonery and immaturity. Overprotective Dad: In regard to Pebbles. Schemer: Fred attempts Zany Scheme on almost a Once an Episode level. Sensitive Guy and Manly Man: The rough, aggressive, and tall Manly Man to Barney's meek, short, and cheerful Sensitive Guy. 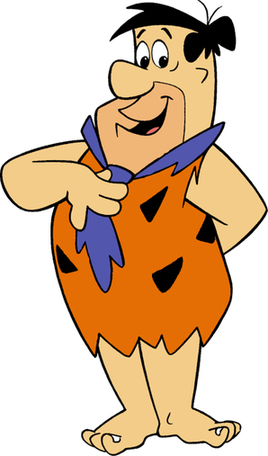 Took a Level in Kindness: While Fred has remained a Jerk with a Heart of Gold from start to present, he was much more hot tempered and rude and borderline abusive towards Wilma and Barney when the show began. After Pebbles was born, Fred's softer side became more prominent and he became more capable of swallowing his pride. Ugly Guy, Hot Wife: Fred's not egregiously ugly, but he is a pretty homely-looking guy. Wilma, in contrast, is a slim-figured, gorgeous redhead. Unsympathetic Comedy Protagonist: He tends to be loud-mouthed, aggressive, and constantly scheming ways to improve his family's working class lot in life. However, hes also a Jerk with a Heart of Gold. Wilma is Fred's wife. She is more intelligent and level-headed than her husband, though she often has a habit of spending money recklessly (with Betty and her catchphrase being "Da-da-da duh da-da CHARGE IT!!"). She's often a foil to Fred's poor behavior. Black Bead Eyes: Her eyes are black dots. Deadpan Snarker: Both Fred and Wilma have their moments, but more so on the latter. Expy: Her personality is based on that of Alice Kramden, wife of Ralph Kramden on The Honeymooners. Fiery Redhead: While she is usually level-headed, don't make Wilma angry! Happily Married: With Fred, though they have their issues. Housewife: Doing the cooking, cleaning, taking care of the children and her husband. Averted in the 1980s series The Flintstone Comedy Show, where Wilma and Betty work as newspaper reporters for the Daily Granite. Also in the 1993 TV-movies where they start their own catering business. Not So Above It All: While she usually serves as the voice of reason for Fred, she will occasionally spend the family's money with reckless abandon, usually along with Betty. Parenting the Husband: When dealing with Manchild Fred, often scolding him for his behavior. Ugly Guy, Hot Wife: Hot Wife to Freds Ugly Guy. Uptown Girl: Wilma's family is rich, and they're rather disappointed that Wilma married "beneath" her. Women Are Wiser: Wilma is much more mature and level-headed than Fred, who borders on Manchild. 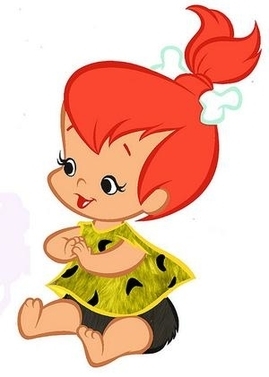 Pebbles is the Flintstones' infant daughter, who is born near the end of the third season. Affectionate Nickname: Nicknamed "Pebbs" by Bamm-Bamm after they become a couple. Often referred to as "Little Pebbly-Poo" by her father. Catch-Phrase: In the teenage years spinoffs, Pebbles uses "Yabba-dabba-doozy!" Befitting, as her schemes usually were. Childhood Friend Romance: With Bamm-Bamm. It could be said that they were the very first pair for this trope. Daddy's Girl: Fred has a soft spot for her. On her part, it's downplayed, especially when Pebbles was a baby. Even though she loves her father, she'll easily replace him with someone she likes. Every Girl Is Cuter with Hair Decs: Well... a Cartoon Bone in this case. Good Parents: Even before the actual birth of her and Bamm-Bamm's baby, which turn out to be twin babies, Pebbles is dedicated to provide a loving, nurturing home. Happily Married: She and Bamm-Bamm — They are both supportive to each other, express their concerns in a communicative way, and deeply love one another. Like Parent, Like Child: As a teenager, Pebbles is often a schemer that gets in way over her head and Bamm-Bamm is a loyal accomplice prone to urging caution. Morality Pet: Fred became much softer with Pebbles around, and can be coaxed into anything if he thinks it's what his daughter wants. Savvy Guy, Energetic Girl: With Bamm-Bamm when they are teenagers. She's aggressive while he's passive. Schemer: In The Pebbles and Bamm-Bamm Show, she shares her dad's penchant for schemes that would inevitably backfire. Strong Family Resemblance: It's evident she inherits most of her mother's looks as a grown up. The only thing she inherits from her father is his eye shape. The Ugly Guy's Hot Daughter: The early 1970s spinoff The Pebbles and Bamm-Bamm Show depicts her as a teenager, and she has indeed grown to be quite a beautiful young lady. Thankfully, Pebbles physically took after her mother. 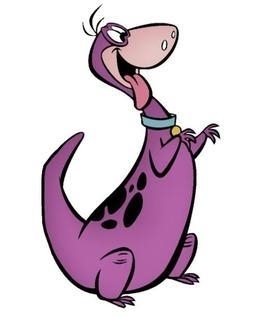 Dino, a prosauropod dinosaur, is the Flintstones' pet that barks and generally acts like a dog. A running gag in the series involves Dino knocking down Fred out of excitement and licking him repeatedly. Though this irritates Fred a lot, he generally likes Dino very much. Amplified Animal Aptitude: He understands humans, and so do most of the animal-based appliances in that world. Characterization Marches On: He was an Intellectual Animal in his debut episode. He reverts to a standardly intelligent non-talking cartoon animal in the next episode he features in and stays that way. Dumb Dinos: Dino and the other tame dinosaurs are friendly but not particularly bright. 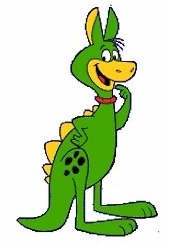 In his debut Dino was actually an aversion - he was able to talk and was more of a household servant than a pet. In the series proper, he has the behavior of a dog, combining this trope with Dogs Are Dumb. A Lizard Named "Liz": Dino (pronounced DEE-no) the Dinosaur. Smarter Than You Look: While he was dumbed down after his first appearance, he still had isolated moments of intelligence or human level sapience. The Stool Pigeon: A Running Gag is that Dino can tell when something is wrong with Fred or he is hiding something, and emotes accordingly. Barney is the secondary main character and Fred's best friend and next-door neighbor. His occupation is, for the most part of the series, unknown, though later series depict him working in the same quarry as Fred. He shares many of Fred's interests such as bowling and golf, and is also a member of the "Loyal Order of Water Buffaloes". Though Fred and Barney frequently get into feuds with one another (usually due to Fred's short temper), their deep fraternal bond remains evident. Beta Couple: He and Betty play the generally happier, conflict-free Betas to Alpha Couple Fred and Wilma. Beware the Nice Ones: When he gets pushed too far, watch out! Fred has found this out the hard way several times. Big Eater: Not as much as Fred, but he is shown to be capable of this in "The House Guest", much to Fred's chagrin. Black Bead Eyes: Has black dots for eyes. Dumb Blonde: Blonde-haired Barney is not the sharpest tool in the shed. He's easily gullible (even more so than Fred) and often has trouble following the simplest instructions without messing up a detail or two. Because of this, he almost always shares part of the blame for why Fred's many ill-fated schemes would inevitably backfire. Expy: His personality was based on that of Ed Norton on The Honeymooners. Heterosexual Life-Partners: He and Fred are one of the most iconic examples. Nice Guy: Nicer and more easy-going than Fred. Sensitive Guy and Manly Man: The meek, short, and cheerful Sensitive Guy to Fred's rough, aggressive, and tall Manly Man. Sidekick: To Fred, usually going along with the latters schemes. Signature Laugh: "A-hee hee hee hee hee hee hee!" Often done with his eyes closed and his shoulders raised. Tiny Guy, Huge Girl: His wife Betty is taller than him. Took a Level in Kindness: Barney wasn't quite as friendly in the earlier seasons. Like a number of other things on the show, he softened after the birth of Pebbles. Ugly Guy, Hot Wife: As with Fred, Barney isn't really all that ugly, just on the homely side of things. Still, he's one lucky little man for having landed quite a knockout like Betty. Betty is Barney's wife and Wilma's best friend. Like Wilma, she, too, has a habit of carelessly spending money. Adaptational Ugliness: In the 1994 movie where she's played by plus-sized actress Rosie O'Donnell, chosen because she was able to do Betty's trademark laugh, which is admittedly a difficult vocal tic to pull off. A Day in the Limelight: She gets her own (and only) episode, "Old Lady Betty." She disguises herself as a little old lady running errands to raise money for Barney's birthday present, but she doesn't know her employer is really a counterfeiter. Beta Couple: One of animation's best known examples. She and Barney even provide the page image. Expy: Of Trixie Norton, wife of Ed Norton on The Honeymooners. Flat Character: Betty has the least amount of screentime among the four main characters and possibly has the weakest characterization of them all. Her interactions are primarily based on her relationships with the other cast, and as such, doesn't have a standout personality of her own. Happily Married: To Barney. And unlike the mild drama that usually comes along Fred and Wilma's lives, these two pretty much have perfect chemistry. Housewife: Shes a housewife like Wilma, though Betty occasionally takes up part-time jobs. Tiny Guy, Huge Girl: She's considerably taller than her husband Barney. True Blue Femininity: She has a blue dress and a blue bow in her hair. Ugly Guy, Hot Wife: Betty and Barney do uphold the trope, much like Wilma and Fred. He's short and homely while she's a raven-haired stunner. Averted in the 1994 Live-Action Adaptation where Betty ended up being played by Rosie O'Donnell, of all people. Bamm-Bamm is the Rubbles' abnormally strong adopted son, whom they adopt during the fourth season. Affectionate Nickname: "Bammers" by Pebbles when they become a couple. Badass Adorable: He could shake an entire house with his club even as a toddler. At times he even got Barney and Uncle Fred out of a pinch with his super strength. Childhood Friend Romance: With Pebbles. It could be said that they were the very first pair for this trope. Cute Bruiser: As a toddler, Bamm-Bamm's excessive strength was often a source of humor. Does Not Know His Own Strength: Poor little Bamm-Bamm had no idea just how physically stressful playtime with him must've been like for Daddy and Uncle Fred. Learning to control his great strength was most likely the reason why he stopped displaying it during his teenage years, only resurfacing it again as an adult when he really needed to — like saving his loved ones from gangsters. Good Parents: Even before the actual birth of his and Pebbles' baby, which turn out to be twin babies, Bamm-Bamm is dedicated to provide a loving, nurturing home. Happily Married: Him and Pebbles — They are both supportive to each other, express their concerns in a communicative way, and deeply love one another. Hunk: The boy grows up to be quite a strapping young man - chiseled jaw and all - as seen in spinoffs like The Pebbles and Bamm-Bamm Show. Like Father, Like Son: As a teenager Bamm-Bamm is a loyal and passive accomplice to Pebbless schemes, much like Barney is this to Fred. Metronomic Man Mashing: Can do this to people at least twice his size, due to his immense strength. Nice Guy: Bamm Bamm has always been a good kid but he grows to be an extremely decent and likable young man. Pintsized Powerhouse: He can lift and carry a grown man with ease as a toddler. Unfortunately, he often Does Not Know His Own Strength. Pokémon Speak: His name comes from the only phrase he ever speaks as a baby: "Bamm, Bamm!" Savvy Guy, Energetic Girl: With Pebbles when they are teenagers. He's passive while's she's aggressive. Super-Strong Child: Though his Super Strength was mostly done for laughs. Wild Child: In the live action film, he was found with wild mastadons. World's Strongest Man: He is billed as the strongest baby in the world, and in later cartoons the strongest teen in the world. By the time of "Hollyrock a-bye baby", his and Pebble's baby daughter Roxy is the new strongest baby in the world. Hoppy is the Rubbles' pet hopparoo, a creature that is part kangaroo and part dinosaur. He appears in the premiere episode of the fifth season and becomes best friends with Dino. Boxing Kangaroo: As seen in a few episodes, Hoppy is quite talented at boxing. Cool Pet: He's a kangaroo/dinosaur creature, he is great at boxing, and he has a pouch that is used for numerous things (ex. a shopping cart, a golf hole, a basketball hoop, and, of course, entertaining the children). In his debut episode, the Flintstones and Rubbles were in danger and Hoppy rushed off to get help, saving the two families. Friend to All Children: Shares this with Dino. Both pets love Pebbles and Bamm-Bamm and spend much of their time taking care of the two toddlers. I Am Not Weasel: Fred and Dino mistake Hoppy for a giant mouse when they first see him. What Happened to the Mouse? : After the original tv series, Hoppy is practically forgotten. He doesn't appear in any of the spinoffs, specials, or movies (with the exception of The Man Called Flintstone). 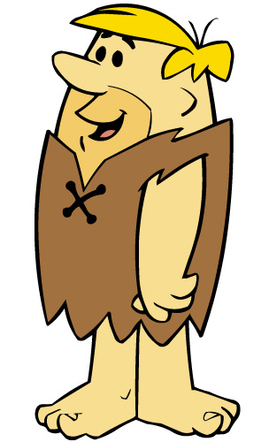 He just recently reappeared in The Flintstones & WWE: Stone Age SmackDown!. Mr. Slate is Fred's hot-tempered boss at the stone quarry. Though he is friends with Fred and Barney and often joins them for events such as parties, he is often not impressed with Fred's antics at the quarry, and has fired him on many occasions, only to give him his job back at the end of the episode. A running gag is his ever-changing first name, which has been presented as Sylvester, Nate, Oscar, and George. On the episode "The Long, Long, Long Weekend", which originally aired on January 21, 1966, he is shown as being the founder of Slate Rock and Gravel Company. The company is still in business two million years later and is being run by his descendant George Slate the Eighty-Thousandth. Benevolent Boss: Most episodes actually portray him as reasonably amiable toward his workers. Wilma even invites him to Fred's birthday party in one episode. George Jetson Job Security: Fred is fired by Mr. Slate very frequently, not surprising since The Jetsons (the Trope Namer) and The Flintstones are cousin shows of each other. The main difference is that, unlike George, Fred usually does something that justifiably would get most people fired. Pearl Slaghoople is Wilma's hard-to-please mother, who is constantly disapproving of Fred and his behavior. Their disastrous first meeting was recounted in the episode "Bachelor Daze", which originally aired on March 5, 1964. They briefly reconciled in the episode "Mother-in-Law's Visit", which originally aired on February 1, 1963. That is, until, she found out that she became Fred's "nice fat pigeon" when he suckered her out of money he need to buy a baby crib for Pebbles. They reconciled again at the end of the TV movie I Yabba Dabba Do. Adaptational Attractiveness: In the cartoon, Wilma's mother is a heavyset version of her. In the film, she's played by Elizabeth Taylor, who is most decidedly not heavy-set. Never Mess with Granny: One of the "beat you with her purse" types, and her purse is made of rock. Obnoxious In-Laws: To Fred. Though, he does treat her appropriately with equal hostility.